We have been taking photos with the iPhone for years. There is many options for not only editing after taking a photo, but also many apps to help with the actual photo taking experience. For the iPad, due to the camera quality on the iPad2, photo taking enhancement apps have been slower to come to the iTunes store. The iPad’s larger screen has been mostly a photo editor for us. 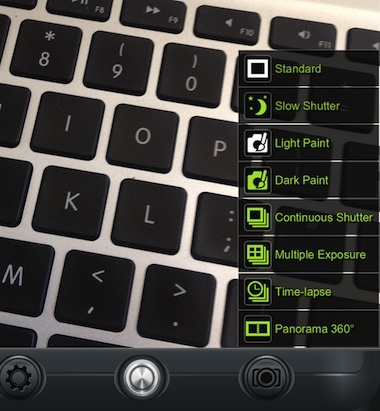 Since the ‘New’ iPad arrival, more solutions for the actual photography step are showing up. One we started playing with last week is MegaCamera. It is for the iPad only, not a iPhone app. When you launch MegaCamera on the iPad, it looks similar to the Apple’s Camera app with the addition of a more informative zoom and a couple more buttons. 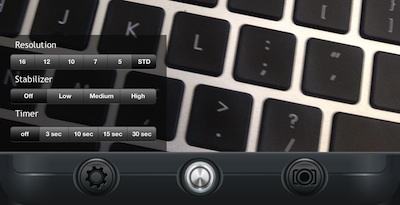 Via the lower left additional MegaCamera buttons, you can adjust the photography Resolution, Stabilization and Timer if you want to have the photo taken without touching the iPad. The Stabilization is important when zooming in on an object so the photo is taken when the iPad is still enough to not take a blurry shot. In low light situations, the Timer is nice so the tapping of the screen doesn’t cause a movement to also create a blur. The camera like button on the lower right corner is the area you need to go to completely change the way your iPad takes pictures. Choosing any of the options changes the icon on the MegaCamera main screen so you always know when snapping a photo if there is an enhancement turned on. Play with these options a bit before trying to use them in front of clients or family, we have learned from our iPhone photography that not all enhancements are as straight forward as they seem. 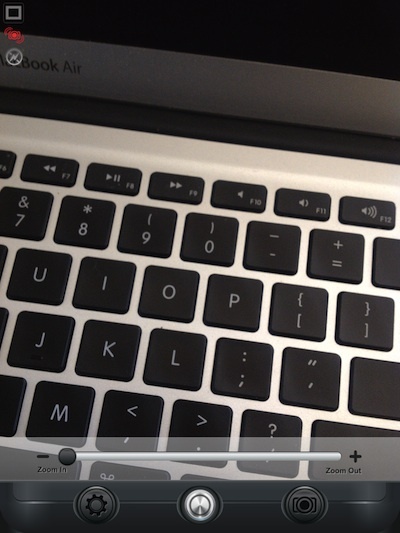 Snapping a photo with MegaCamera will take you to a share/save screen. Without having to leave the app, you can send the email as an attachment in an email, save to your iPad’s photo library or share with friends/family/clients through the popular social services like Facebook.